Eagleheart Seaon 1 DVD Review Eagleheart is a completely absurd experience, but in all of the right ways. Produced by Conaco, Conan O’Brien’s production company, Eagleheart joined the Adult Swim line up in 2011 and finally makes it way to our shores with this release of Season One. 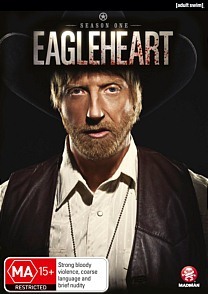 Starring Chris Elliot (There’s something about Mary) as US Marshall Chris Monsanto, Eagleheart is a slickly produced live action parody of shows like Walker: Texas Ranger, albeit with much more gore. After his latest partner leapfrogs directly into an aeroplane propeller, Monsanto finds himself saddled with not one but two replacements: Beautiful and intelligent Susie (Maria Thayer) and the hirsute -and possibly mentally disabled - Brett (Brett Gelman). Monsanto’s track record with his partners is spotty at best and The Chief of the department, who may or may not be Orson Welles, figures that when the inevitable occurs and one of the new partners die, Monsanto will only be half as sad as he usually would be. This admittedly bizarre premise acts as a framing device for the misadventures the trio find themselves thrust into; there’s little to no continuity between episodes and each one only runs for around 12 minutes, so the silliness doesn’t overstay its welcome. The plotlines are appropriately goofy, but yet strangely grounded within the context of their own twisted logic; people moulded out of Cocaine, Evil Sky-Barons, a guerrilla militia group with a predilection for swinging and a magical jewel guarded by mountain lions are just some of the weird directions the plots head in. Despite the absurdity of it all, Eagleheart has a talented stable of writers that actually make you believe in all of the ridiculousness; it rarely feels trite or forced. With that being said, there are a few uneven moments, particularly with the character of Monsanto himself; occasionally he’ll behave out of character in comparison to what has been previously established, most noticeably during the first few episodes, but this minor niggle can be attributed to the growing pains that usually come with the first season of a show, and by the latter half of the season the writers appear to have locked down both the character and the overall tone of the show. Elliot shines as Monsanto, but the true heart of the show lies with Brett and Susie; their diametrically opposed personalities may be torn straight from that old ‘The Odd Couple’ writing cliché, but the rapier sharp wit of the script and the performances from Gelman and Thayer rise the characters above their generic character templates; indeed, the episodes that focus more predominately on Monsanto’s partners are among the most enjoyable. The disc transfer cannot be faulted in any way, easily maintaining Madman’s high standard. There is an intentional softness to the image that lends the show a kind of ‘direct-to-cable’ aesthetic, and the audio is crisp and delivered with the clarity expected of a Dolby 5.1 surround mix. Eagleheart comes fully loaded with a raft of extras that are sure to satisfy even the most ardent fan. There’s a lengthy discussion panel at the New York Comic-Con (With a sneak peek at Season 2), the usual deleted scenes and outtakes and twenty, count them, twenty commentaries... For twelve episodes. For a commentary junkie like myself this is as good as it gets; one track predominately features the actors whilst the other has the writers ruminating on the process of getting the episodes from script to screen. Rounding out the package is a Kill Reel that collects all of the deaths in the show, promos for each episode and, by far the most interesting feature, scenes taken from the original pilot. Initially Eagleheart was going to be a tad meta, focusing on the antics of washed up actor Ray Vanderhoof and the tribulations he faces whilst filming the eponymous low budget series. It’s fascinating to see how the concept for the program has changed so dramatically since its initial inception and even features an amusing cameo from the ginger one himself. Eagleheart is a completely absurd experience, but in all of the right ways. The writing is, for the most part, above par and the performances are pitch-perfect. Elliot carries the show effortlessly and the non sequitur style of humour will appeal to anyone with even a passing interest in Adult Swim’s unique programming. Personally, I find that many of their live action programs tend to be lacking in comparison to their animated efforts such as The Venture Brothers and Sealab 2021, but Eagleheart manages to buck the trend and stand shoulder to shoulder with the best of them. Highly recommended for those who like their comedies with a healthy absurd streak.